Why this guide about how a La Spaziale machine works? We thought it would be a good idea to explain in detail how our La Spaziale espresso machines really work and what they do to make it one of the most reliable machines on the market. We have taken pictures of all the components with the exception of the pump. 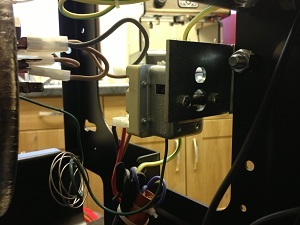 In some cases the components have been opened up to enable you to see the inner workings. This is a picture of the back of the machine. You can see the large 10L boiler with the heating elements and the cores. On top of the boiler you can see the two heat exchangers, one on the left and one on the right. In the centre on top of the boiler you can see the water level probe, the pressure relief valve and the hot water outlet. On the left of the machine you can see the temperature probe to measure the steam temperature and the electrical wiring. This is a cut-out of the heat exchanger and is the core of the machine. 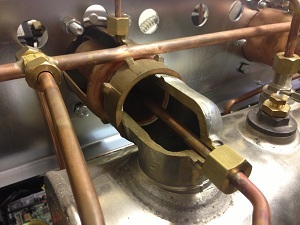 The heat exchanger is a system designed to heat the brewing water that is used for the espressos. 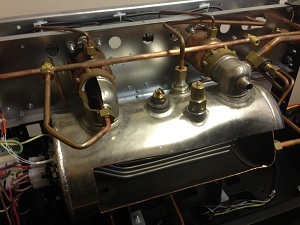 The better the heat exchanger works the better the coffee will be. La Spaziale heats the brewing water with steam which is an extremely reliable method. The group head is filled with fresh water. Inside the group head is a large tube that is filled with steam acting as the heating element. This is extremely efficient in terms of power and reliability as there will be less limescale build up. 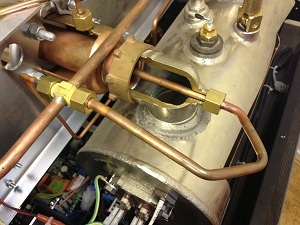 Most heat exchangers are submerged in boilers which cause problems as limescale will form on the exchanger. 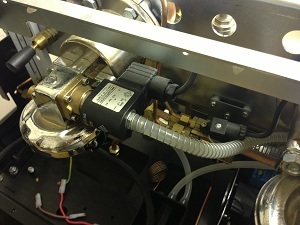 The patented heating system from La Spaziale makes the machines extremely reliable. 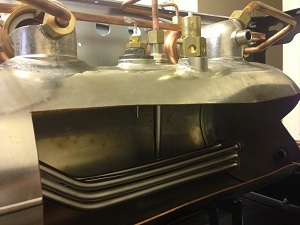 A close up picture of a cut-out from the heat exchanger. The water is fed into the group head from the pipe on top of the group head. You can see the tube inside which is filled with steam. The heat exchanger holds enough water to ensure temperature stability throughout the day and during the brewing. This system can handle large demands during peak hours due to the efficiency of the heating system and the large group heads. This is a picture of the flow meter. The flow meter is responsible for measuring very accurately how much water is going through the coffee, basically your shot volumes. The flow meter works by measuring how many cycles or pulses it does as the water is passing through. This is really important as it will ensure consistency between shots. A picture of the front of the machine. You can see the two group heads and the mainboard. 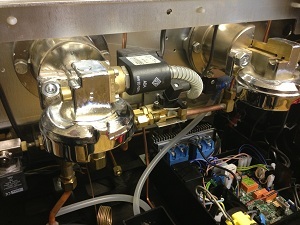 On the right side of the group head you can see the three way valve. This is the three way valve (opened up) and is very important. It ensures that water is passing through the system in the right direction. After brewing, it will ensure that any remaining water under pressure is directed to the drainage. The three way valve works using a magnetic procedure to open and close it. Whilst back-flushing the machine the three way valve is cleaned. If the three way valve was to become blocked with little bits of coffee it could cause the group head to drip and/or it can cause a blockage towards the drainage. This is one of the reasons why back-flushing correctly on a daily basis is so important. You can see the manual fill handle in the background. This handle allows you to manually fill the boiler. Not something you would likely ever need yet still very important to have on an espresso machine. 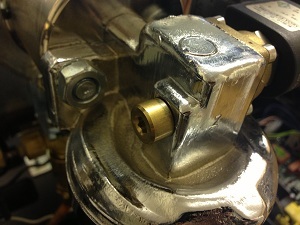 If the inlet water valve is blocked due to limescale for instance then it might prevent water from entering the boiler. 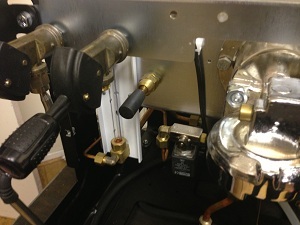 You could then bypass the inlet water valve by manually filling the boiler. Also used by engineers during the initial installation and testing. A handy water level sight glass to indicate the level of water inside the boiler. 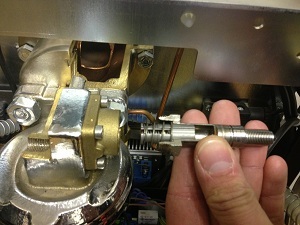 The water level inside the boiler can be adjusted by adjusting the water level probe on top of the boiler. Usually the boiler is filled between half and three quarters full with water. 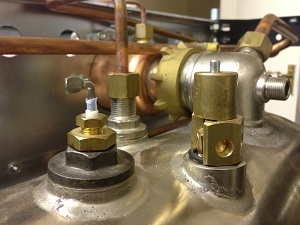 On the right of the picture you can see the inlet water valve which controls how fast water enters the boiler. This can be adjusted to give water pressure priority to the group heads. A picture of the side of the boiler. You can see the temperature probe (white) on the top right. This measures the temperature of the steam inside the boiler. As the temperature probe is measuring steam rather than water, the probe is not submerged in boiling water. Therefore reducing the risk of limescale build-up on your probe. Below the probe you can see the cables which are connected to the cores of the element inside the boiler. 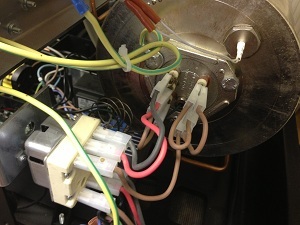 The wiring can be adjusted to change the machine from single phase to three phase and to downgrade the elements. Another picture of the inside of the boiler. You can see the water level probe on the left side of the middle entering the boiler. This water level probe can easily be adjusted. On the right side of that you can see the hot water outlet. The boiler is subject to limescale as the water is always boiling. Water softeners are therefore extremely important and need to be replaced periodically to ensure they work correctly. 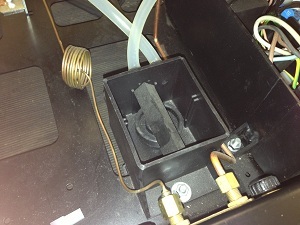 Limescale on a the heating elements will slow down the heating process. Limescale on the water left probe can cause problems with filling. Limescale and lack of cleaning are the number one reason for trouble. The top of the boiler. On the left you see the water level probe. This is normally connected with a wire to the mainboard. Very important to ensure that there is no limescale on the probe. If there would be then the machine would overfill. During a service this should be checked and cleaned. 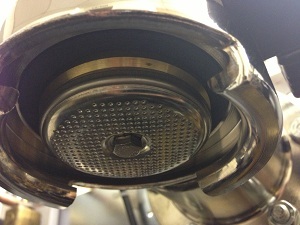 La Spaziale machines have a three minute cut out during filling which will prevent flooding in case of malfunctioning. A very good safety feature. 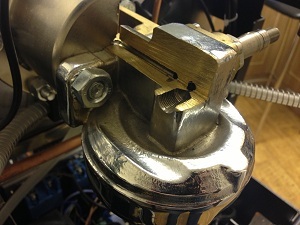 On the right side you can see the pressure relief valve. Also very important to check during a service. The pressure relief valve is there in case the boiler gets too hot. The valve will open and steam will escape releasing the pressure. This should never happen and if it does then an engineer needs to be called out. The valve is very important for safety of course and should be tested thoroughly during a service. Another picture of the three way valve although this time with the casing on. The hose leads to the waste. When you are backflushing an espresso machine this is where the water and cleaning solution flows through. 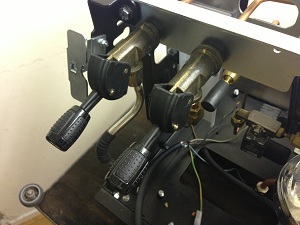 One of the best features of La Spaziale machines are the levers used for operating the hot water and the steam. These levers make milk steaming extremely easy as it allows for a quick on and off operation. This gives the barista the chance to hold the milk jug with both hands which gives more control when making micro foam. This is the waste or drainage basket. The two hoses come from the three way valve and from a pressure valve to release water in case of overpressure. This waste basket is usually connected to the drainage although can also run to a bucket underneath the machine. On the left side you can see the copper pipe leading to the pressure gauge. 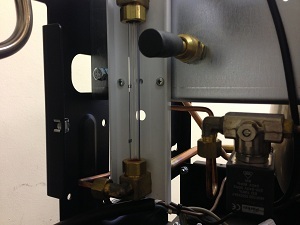 This measures the pressure of the inlet water and the pump pressure. The pipe on the right side is measuring the pressure of the steam inside the boiler. This gauge measures the water pressure on the left and the steam pressure on the right. The inlet water pressure is usually between two and four bar and should not be much more than five bar. 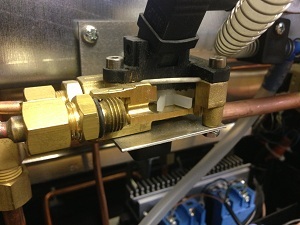 If your inlet water pressure is much higher, then a pressure reducing valve is required. During the brewing the pump should be at nine bar. 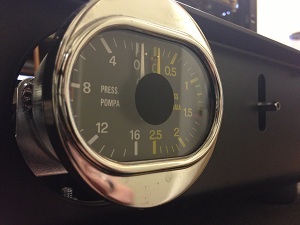 The dial on the right measuring the steam should be around one bar depending on how hot you are running the machine. This is the main board. 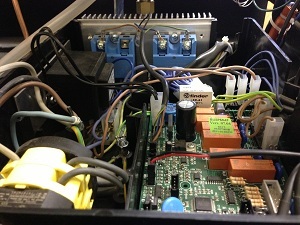 A very reliable board that is controlling most of the functions of the machine. Located in a good position for the engineers to reach. 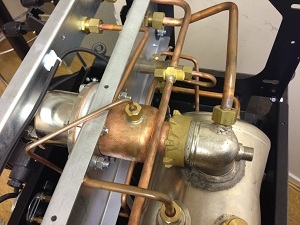 A top view of a cut out of the heat exchanger. 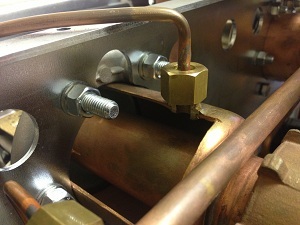 A view of the heat exchanger. This is a picture of the shower block and the shower screens (the under side of the group head). La Spaziale use 53mm group heads and deeper, narrower baskets than most other espresso machines. This makes tamping easier and it produces beautifully even extractions. The shower block can be easily removed for cleaning. When back-flushing the group head you clean between the shower screens to remove any oils and coffee. It is very important to clean on a daily basis (only takes five minutes) to ensure the water is passing through the shower screens the correct way and not trough old oils first. This is a cut out of the top of the group head and shows the position of the ITC. The ITC is an Independent Temperature Control system that allows cold water to enter the group head to mix with the hot brewing water. This gives the barista the option to brew at any temperature. It is especially useful for sites where extra steam power is required. You could run the machine extra hot to generate plenty of steam and run the group heads cooler to extract the correct flavours. You could also run each group at a different temperature. The ITC is an additional feature on most models and built-in on some. This show the ITC inlet again. Once installed, the ITC will draw cold water from the a T junction just before the flow meter. This cold water enters the group head here and mixes with the hot water from the heat exchanger. This is a picture of the safety cut out switch. This switch is to protect the heating element in the boiler. In some cases it will activate and needs to be pushed in again to deactivate. A very clever and important safety feature to ensure the durability and reliability of your La Spaziale machine.